You are currently browsing the category archive for the ‘New Category’ category. Like a large, featherless bird on a very long migration route, I often make stopovers in between Melbourne, Australia and Grand Pre, Canada. Inevitably, the longest and most rewarding one is a layover in Portland, Oregon, to catch up with my oldest son, his wife and family. The summer visit is the longest, and it often coincides with his birthday, July 16th. This year I happened to hit a milestone– the big Four Oh. His mother has her own migration pattern. 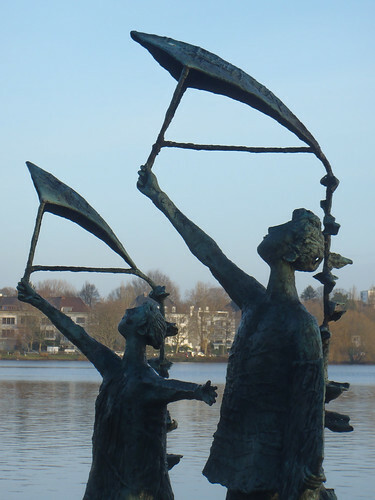 Until recently it was a triangular path, from a home base in Southern California back to her original home in the Netherlands, then up to Portland. She now has a house in the same neighborhood of Portland as our son, and was good enough to offer me the guest room. 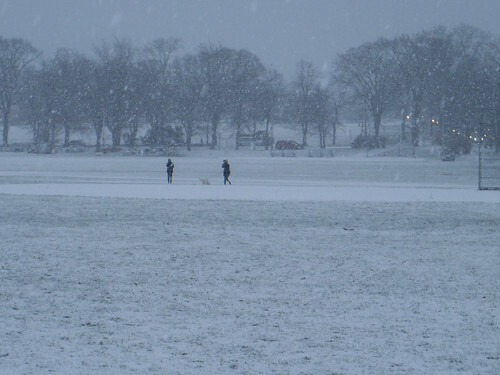 My last visit through was a quick stopover in early December, 2011. 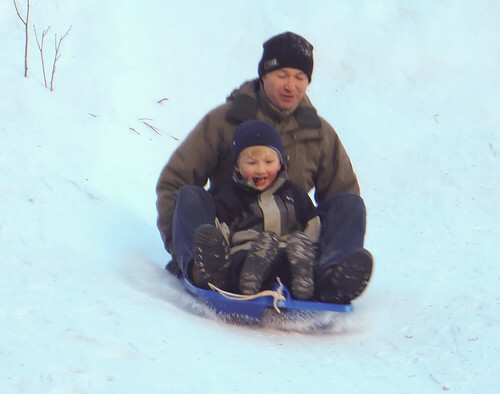 My son borrowed her four-wheel drive Subaru and we went up to Mt. Hood for a day of snow shoeing and sledding. This time he took some time off work and we drove to a small, but thriving town on the Columbia River Gorge called Hood River. It is a mecca for windsurfing and kiteboarding, not to mention the home of “Full Sail,” a wonderful brew pub. From there, we headed due South, along the Hood River, making detours to see three farms, one with fields of lavender, one with recently shorn alpacas, the last with the real money maker in this area– berries and other fruit. 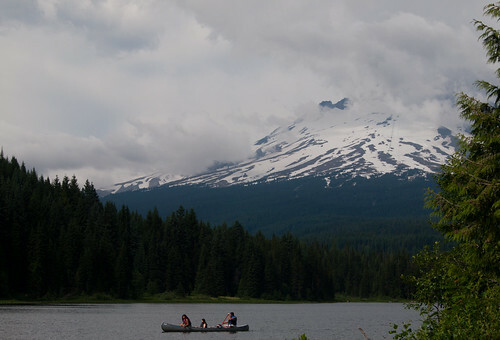 Our afternoon was devoted to a walk around Trillium Lake, with its spectacular views of Mt. Hood. Last summer we signed on for a weekend trip as part of Bike Oregon. 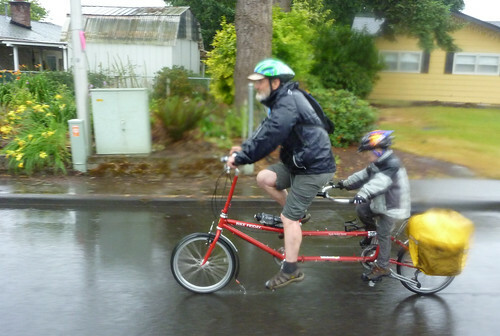 He had acquired a second-hand Bike Friday tandem, so Lucas could come along. The route was through the Willamette Valley, in the country around Salem, the state capital. I had booked a tent, so we had instant accommodation. What we hadn’t counted on was a weekend of solid rain. Salem’s rain usually comes in late Fall. June through September is the dry season. Nevertheless, the campus at Willamette University was attractive and the organization of Bike Oregon was impressive. I enjoyed the music and the friendliness of the volunteers and the other riders. The Capitol building itself is one of three art deco capitols in the United States. 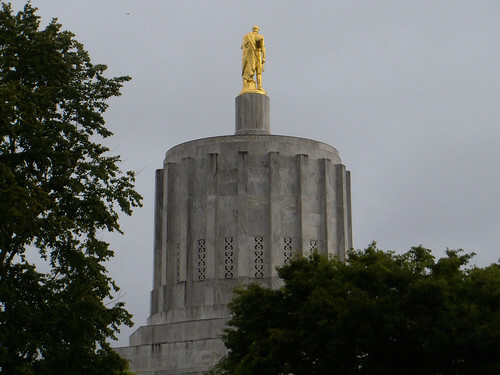 It is certainly striking, with the gold statue of an Oregon pioneer visible for miles around. Yesterday, Dolan’s mother and I headed up the Gorge again into the dry country of Eastern Oregon, a mere twenty miles from Hood River. As different as night and day. The destination was a concrete box of a building on the Washington side. It was constructed as the home of Sam Hill, a Pacific Northwest entrepreneur. He bought five thousand acres along the river, hoping to establish a Quaker community. It was called Maryhill, after his daughter. The community never took off, however, and he ended up creating a museum instead of a home with the help of some odd, artistic connections he made during his trips around the world. It holds a substantial collection of furniture from Queen Marie of Romania, some souvenirs from the life of a vivacious dancer by the name of Loie Fuller, and works donated by a San Francisco socialite by the name of Alma de Bretteville Spreckels. There is a wonderful collection of chess pieces from around the world, an excellent display of Native American crafts, and a room full of Rodin sculptures and drawings. I don’t think that has ever been a problem. 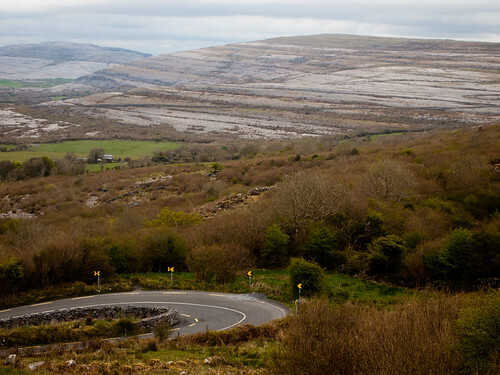 Most tourists flock to County Clare for one of three reasons– the Burren, the cliffs, or to hear traditional Celtic music in the world-famous Doolin or one of the other villages. We had time for only one attraction, and if I hadn’t booked us into a fancy hotel in Clare for the weekend, I would have bailed and stayed in Connemara. A steep cancellation penalty dissuaded me from doing so. Gregan’s Castle Hotel is featured in the Lonely Planet guidebook in glowing terms. It offers seriously chic cuisine, the kind that has to be described in long paragraphs so you can appreciate exactly what it is you are placing into your mouth. Each plate seems to have been designed by a culinary artist as interested in the overall visual effect as in the actual taste. This is not comfort food. It is like being offered a ride in a Lamborghini when you just want to go for a spin. That said, the hotel is elegant and lovely, looking out over the strangely mesmerizing Burren landscape, a geological bare plate. 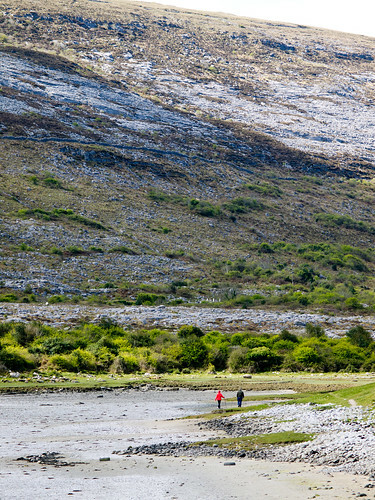 How do you describe the Burren? It is a bizarre, rock-strewn, limestone landscape, scraped bare by glaciers, yet criss-crossed with cracks known as “grykes.” The region supports arctic, Mediterranean and alpine plants side-by-side, due to the unusual environment. The limestones formed as sediments in a tropical sea approximately 350 million years ago. The strata contain fossil corals, crinoids, sea urchins and ammonites. 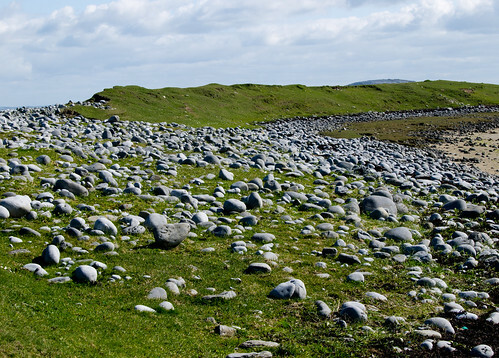 The Burren is rich with historical and archaeological sites. 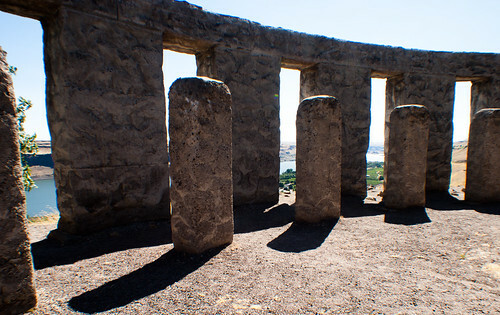 There are more than 90 megalithic tombs in the area, including portal dolmens as well as a number of ring forts. The grykes (crevices) provide moist shelter, supporting a wide range of plants including dwarf shrubs. Where the surface of the pavement is shattered into gravel, many of the hardier Arctic or Alpine plants can be found. Where the limestone pavement is covered by a thin layer of soil, patches of grass are seen, interspersed with plants like the gentian and orchids. Edmund Ludlow, a commander of British forces in Ireland in the 1650’s had this to say about the region: “(Burren) is a country where there is not enough water to drown a man, wood enough to hang one, nor earth enough to bury him…… and yet their cattle are very fat; for the grass growing in turfs of earth, of two or three foot square, that lie between the rocks, which are of limestone, is very sweet and nourishing. While my wife devoted her morning to polishing a paper for a conference in London, I signed up for a boat ride below the magnificent Cliffs of Moher. 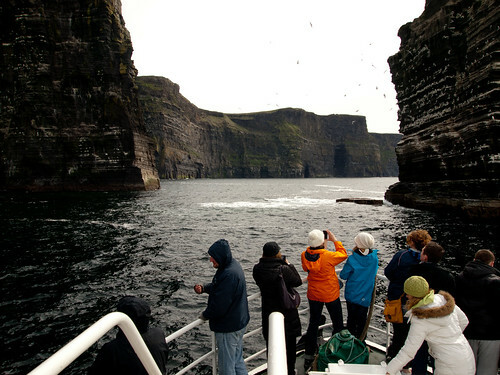 The cliffs are Ireland’s number one tourist attaction; they receive more than a million tourists a year. They rise 120 metres (390 ft) above the Atlantic Ocean at Hag’s Head, and reach their maximum height of 214 metres (702 ft) just north of O’Brien’s Tower, eight kilometres (five miles) to the north. The cliffs consist mainly of beds of shale and sandstone; the oldest rocks are at the bottom of the cliffs. The government saw fit to invest 32 million pounds (nearly fifty million dollars) in a visitors’ centre which purports to explain the “experience,” but for my money, the boat trip below the towering cliffs is far more impressive. Just like our dinner in the bar on the Sunday after all the people who mattered had left Gregans’ Castle. The food was simple, delicious, and needed no explanation at all. The best things never do. There may be easier ways to get from Grand Pre, Nova Scotia, to Hamburg, Germany, but the most direct way is the flight to London from Halifax. Unfortunately, it is a red-eye, scheduled to leave around midnight. It lands in London around 9:30 AM. 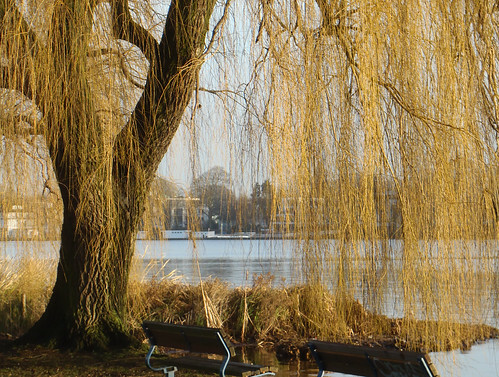 The first available, reasonably-priced flight to Hamburg leaves at three in the afternoon. On paper, that doesn’t seem like too much of a problem. In reality, it is a nightmare. The night flight to London is too short to get a proper night’s sleep and there is nowhere in that section of Heathrow offering any semblance of rest or relaxation. So, we arrived in Hamburg absolutely exhausted. Our handful of German words had disappeared and the taxi driver was quite dubious about our destination. He offered to take us to the Elysee Hotel to pick up the key, but had no idea where the Gasthaus might be, even though I had the address and assured him it was only a short distance away. People who are nearly catatonic so easily pass for idiots, especially when they don’t speak the language. In the end, it all worked out just fine. When in doubt, dress well. That’s our motto. For those readers unfamiliar with the two hemispheres, it is now summer in Melbourne. It is a good time to be elsewhere as the temperatures in Australia tend to soar into the stratosphere. This year, our escape entailed a return to our home in Nova Scotia (for Christmas), and a visit to the Max Planck Institute in Hamburg, Germany for January and February. Not to mention a brief stopover in Halifax, Nova Scotia. You sentimentalists will be happy to know that our Christmas in Grand Pre was white, although the snow disappeared soon after it arrived. Maritime climates are fickle that way. Two years ago they were skating on the lake called the Alster, within walking distance of the Gasthaus. This year it is fine for boats and birds. It is a winter of rain. 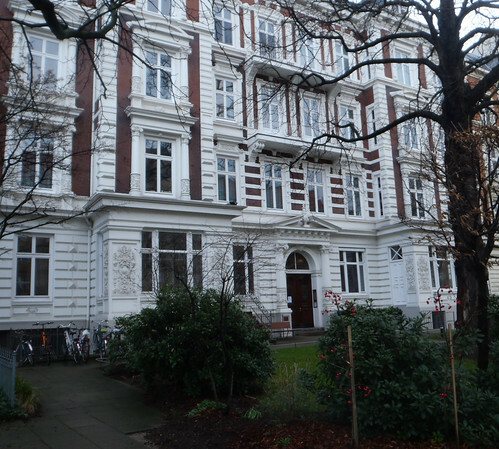 We are fortunate to have found a home away from home at the Gasthaus of the University of Hamburg, a building that has some serious history and a wonderful staff. We are not the only visitors here associated with the Max Planck Institute, which runs a centre dedicated to Comparative and International Private Law. The nearly 80 research institutes of the Max Planck Society conduct basic research in the natural sciences, life sciences, social sciences, and the arts and humanities. They have a total staff of approx. 13,000 permanent employees, including 4,700 scientists, plus around 11,000 non-tenured scientists and guests. Their budget for 2006 was about €1.4 billion, with 84% from state and federal funds. The Max Planck Institutes focus on excellence in research, with 32 Nobel Prizes awarded to their scientists, and are generally regarded as the foremost basic research organization in Germany and Europe. We are talking big potatoes for a country this size. Exploring Hamburg and the surrounding area will be a new adventure, challenging for both us in terms of language and culture. This is will be the first of several posts based on my sojourn here. And I have some catching up to do, so you will find me backtracking to do a couple more posts in Australia. Things have been a bit hectic of late, and I’ve been preoccupied. We are in a good place to write now, so stay tuned. One would not have to be too very cynical to conclude that the whole idea behind the Big Fat Royal Wedding is an attempt to shore up flagging interest in the Royal Family. There is a succession problem, after all. Prince Charles is perceived as something of a wacko, partly because he seems to have taken an odd, unhealthy interest in preserving the planet. Royals don’t do that. Their job is to consume resources on a vast scale. The castles, the clothes, the gold gilt carriage, etc. It is a all a question of entitlement, and the Brits seem to get a vicarious thrill from indulging their surrogate, royal selves. 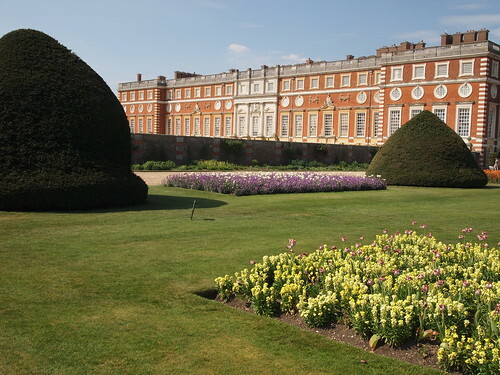 If you want to get a sense of the scale of consumption, you could do worse than visit Hampton Court Palace. It belonged to Cardinal Wolsey before Henry VIII got his hands on it, but in just ten years Henry spent more than £62,000 rebuilding and extending the buildings and grounds. That would be approximately £18 million today. When he died in 1547 the King had more than 60 houses, but none were more sumptuously decorated than Hampton Court Palace. Henry’s palace was one of the most modern, sophisticated and magnificent buildings in all of Europe. 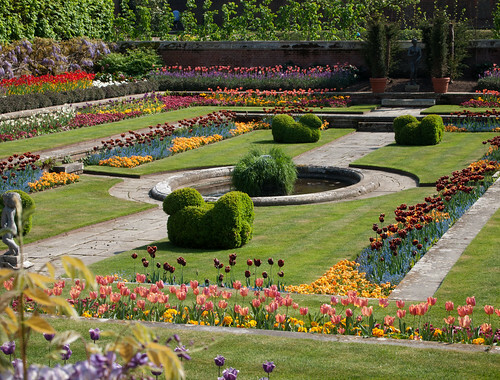 There were tennis courts, bowling alleys and pleasure gardens for recreation, a hunting park of more than 1,100 acres, kitchens covering 36,000 square feet, a fine chapel, a vast communal dining room (the Great Hall) and a garderobe (or lavatory) – known as the Great House of Easement – which could sit 28 people at a time. It was not quite Versailles, but not too shabby as palaces go. 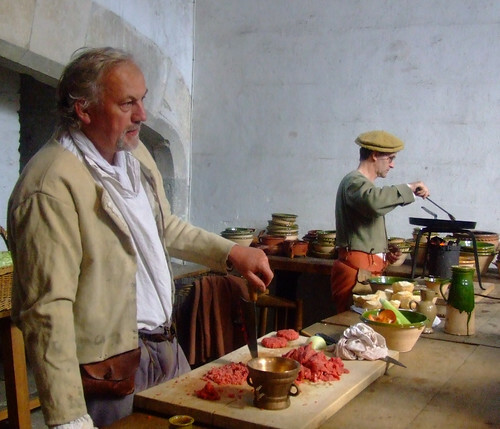 In August, 1546, Henry played host to the French ambassador and his entourage of two hundred gentlemen – as well as 1,300 members of his own court – for six days. An encampment of gold and velvet tents surrounded the palace for the occasion. These sorts of feasts depleted the countryside, of course, requiring regular moves from palace to palace. 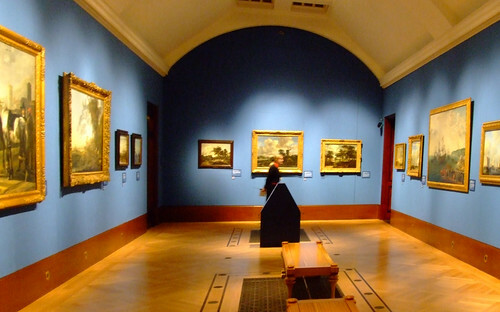 Our own invite to the wedding has not been forthcoming, but we did take advantage of a somewhat impersonal invitation (extended by way of a poster in the tube station) to view a small collection of Dutch landscapes in the Queen’s Gallery at Buckingham Palace. It was Easter Sunday, and serious tourists had camped out in front of the Palace to see the changing of the guard. The Queen’s Gallery is tucked in close to the Mews, where the royal horses are being groomed for the Big Event. 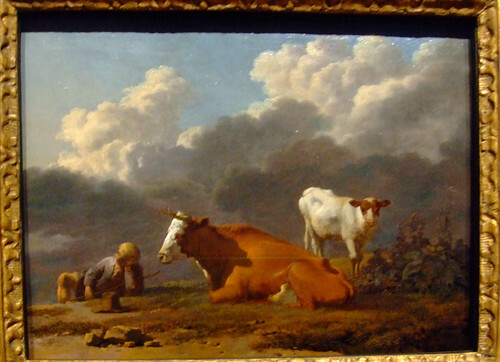 Most of the paintings were purchased by George IV, who had a penchant for the “good” life, but was also partial to paintings of rustic, rural scenes, where peasants brought in the hay in a soft golden light. For him, it must have seemed fanciful and fun. You might assume that time is not right to be plotting to overthrow the monarchy, but Republic, a tiny, London-based, anti-monarchist organization recently held a meeting in a pub just south of Queen Square. Forty brave souls showed up, united in a common cause. They would very much like the monarchy removed from their country’s pocketbook and constitution. Bolstered by fellow comrades in Commonwealth countries such as Canada and Australia, Republicans are hoping that when the international spotlight shines on the Royal Family during the wedding palooza, the flawed system will be laid bare. They argue that the monarchy is unaccountable and unrepresentative, a drain on public resources and it makes a joke of democracy: Only half of Britain’s parliament is elected, and the head of state can never be. They say the Royal Family cost British taxpayers £180-million (about $285-million) through payments, deferred taxes and security costs. The Royal accountant begs to disagree. 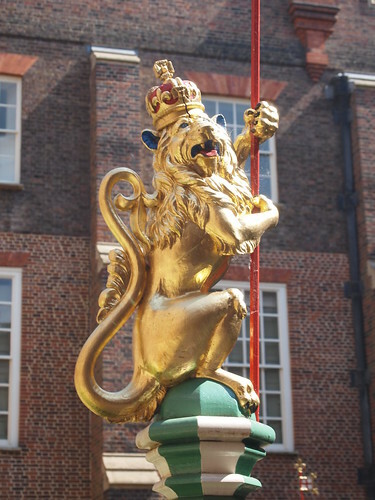 Republicans have been given the green light to hold a street party on the day of the royal wedding in Red Lion Square. A spokesman said they will celebrate “democracy and people-power, rather than inherited privilege” on April 29. So, will it all come crashing down when the the Queen shuffles off the mortal coil? Don’t count on it. As “The King’s Speech” makes abundantly clear, the Royals may be a mediocre lot, but they are resilient. And if they have to skip a generation to keep the throne intact, it will probably be arranged. Prince William will be King before Charles has counted the royalties from his new book. The author of “Harmony” has a lot to learn about winning hearts and minds. He could have picked up a thing or two from his mother or his ex. Or the brand new daughter-in-law, the Princess Bride.